For the past six years, my staff of talented writers, Rick Wilson, Patrick Tiscia, John Nestor, John Torsiello and newly added Rich Elliott, have been bringing you stories that highlight what is good and positive in the local and national sports scene. We strive to chronicle people doing the right thing in the sportsworld and in our respective communities, covering stories that benefit and inspire those who read them. LCS was founded by myself, Wilson and Tiscia after each of us recognized that we wanted to do something different than what was out there at the time. We received some great advice from friends who enjoyed the work that we did and not only created a site that we could be proud of, but one that would spread out into additional markets that includes a television show on our local cable provider, the ability to broadcast remotely and special recognition dinners for local athletes in our area. Along with the local sports scene in the Litchfield County area, we cover the University of Connecticut and regularly travel to see former athletes from our area as they move on to play at higher levels. Over these last six years, we have provided our readers stories that we hope have touched some of their hearts, made them laugh or just made them think. In order for us to continue to bring you the quality work that we enjoy bringing to you, we need some help from the community. With a large, talented staff that has well over 150 years of experience between them, I know our readers enjoy the work they bring to the site. I have heard from many of you. To continue do that, we need funding. Raising capital today is no easy task. With your help we will also look to upgrade our camera and video equipment which will allow us to be even better than we are today. Join us in this venture. No amount is too small. All will be greatly appreciated. Thank you in advance for your generosity and trust that we will continue to accentuate the positive in our communities. As we approach the end of another terrific year in local and state sports reporting, we want to take a moment to thank all our loyal followers. 2016 had some great moments attached to it and we look forward to 2017 when we will continue to point out what's going right in our communities. With tremendous writers like Rick Wilson, Patrick Tiscia, Rich Elliott, John Torsiello, John Nestor and more supplying content, we can't help but be excited about the future. With more and more traditional writing outlets going by the wayside, we truly understand that what we have if the future but we need your help to continue what we do. We are not a large corporation, we are fully funded by our sponsors and advertisers and the hard work of my family to keep us afloat. We would love to work our folks more, bringing you stories by great story tellers who I mentioned above but we need your help. I thank you in advance for your consideration. Tim Gaffney-owner/operator of Litchfield County Sports. 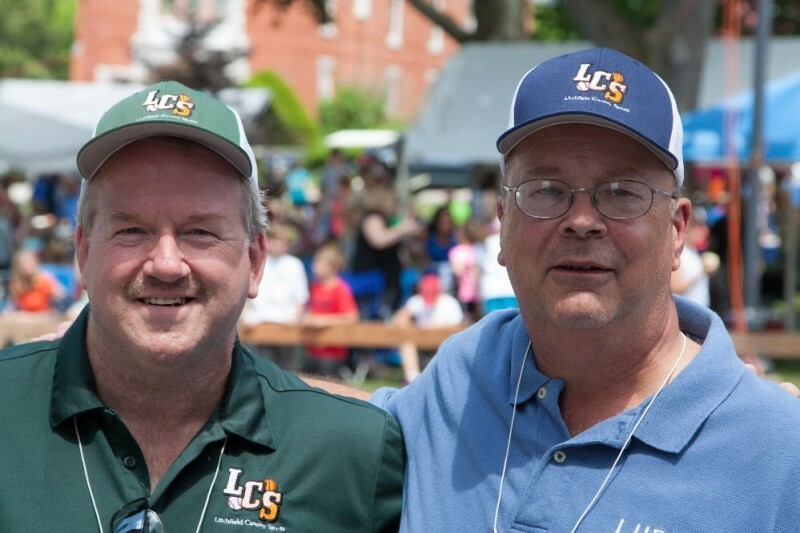 Tim Gaffney, Rick Wilson and Patrick Tiscia created Litchfield County Sports in 2009 after hosting a successful radio program together for nearly six years. Their goal was to have a venue that would allow them to tell the stories that you wouldn't find anywhere else. Since the company was formed several terrific writers joined the team, including John Nestor, John Torsiello and most recently, Rich Elliott. Look for information on each of these terrific writers this week and please consider donating so we can continue to bring you the community based stories you will only find here. Hello Litchfield County Sports fans! As the New Year rolls on, we are hard at work bringing you the stories in our own unique way. Our goal is to allow some of the best writers in the state the ability to pursue their passion. We need your help in this effort. Thank you in advance for your support and we will see you out there! "Thank you for all that LCS does to highlight the positive stories in our community. Having gotten to know Tim, Rick, and team very well over the years, they are as genuine as they come. Keep up the great work and telling the great stories from our area." Michael Fabiaschi is an example of one of the best young men to come out of Torrington High School. We truly appreciate his kind words. Thanks for your tireless efforts in shining a light on our many great kids! Great coverage of local events - LCS! Love Litchfield County Sports! Thank you for all you do in our community. Thank you for all you do for Torrington.